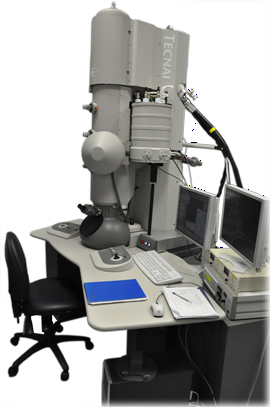 The University of Manchester Faculty of Life Science has a Polara transmission electron microscope for high-resolution cryo-electron microscopy. The microscope was funded by generous grants from the Wellcome Trust and the University of Manchester. The Tecnai G2 Polara is fitted with a Gatan post column energy filter. This microscope is a cryo-transmission EM with a 300 kV field emission gun (FEG), which allows high resolution imaging of proteins in their native state. Defining the molecular basis of cell-mediated ECM assembly. Elucidating the molecular basis of cell-matrix adhesion and signalling. Determining the structure of ECM macromolecules. Determining the structure and function of P2X receptors and the cystic fibrosis transmembrane conductance regulator (CFTR) protein. To complete these studies the microscope is being used to generate thick section tomograms of tissue sections and cryo-single particle reconstructions of macromolecules frozen in vitreous ice. 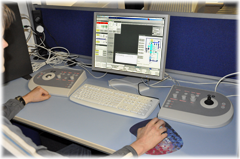 Our electron microscope facility is available to both internal and external users for independent or collaborative projects that fit the expertise of our members. The Polara can be loaded with 6 samples, for convenient screening of multiple samples. The microscope has reliable grid loading and specimen transfer (achieved through a protected environment in the loading bay, and the transfer system under vacuum). The microscope stage is stable to allow high resolution imaging. The design also gives a low rate of specimen contamination in the microscope. To collect high resolution data the images can be captured on film or the 4k by 4k Gatan USC 4000. Electron tomography is a method of generating a 3-dimensional reconstruction of a thick section by collecting a series of tilted images. The Polara is equipped with tilt rotate cartridges that allow high angle (+-70 deg) tilt and 90 deg rotation of the grid without removing the sample from the microscope vacuum. The use of a cartridge-based system also increases the stability of the sample within the beam and reduces errors in stage movement during data acquisition. The FEI G2 Polara microscope is housed in a purpose built room within the electron microscope facility. The air handling maintains the temperature to within one degree centigrade. The room is well insulated from noise and vibrations. It is also possible to use remote access to control all of the microscope functions. This means that the Polara is able to reproducibly collect high resolution data. We are happy to give advice about installation and running the facility for people who are planning on installing a Polara (or similar) microscope.